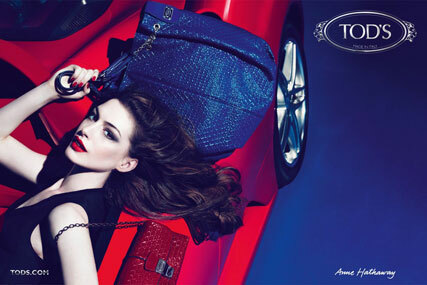 Not content with being an Oscar-nominated actress and a Marie Claire cover star, Anne Hathaway can now add fashion poster girl to her CV as she’s unveiled as the new face of Tod’s. Pictures just released – shot by hot photography duo Mert Alas and Marcus Piggott – show the gorgeous One Day star draped seductively over the bonnet of a red sports car whilst clutching a couple of handbags from the luxury leather label’s new signature collection. The ads show Anne’s vampy side, all alabaster skin and blood red lips and nails (perhaps touching on her upcoming role as Catwoman in gothic Batman flick, The Dark Knight Rises), and will be part of a print media campaign kicking off this autumn/winter. The line, which is due to hit stores in October, features handbags and small leather goods with the Italian brand’s signature pebble motif in a colourful palette including deep red, fuchsia, electric blue, violet and black, aimed at a ‘new and younger clientele’. The American star follows in the footsteps of fellow actresses, Gwyneth Paltrow and Sienna Miller, who have both starred as the face of label.